Yet, church history is making a comeback. Church history is rising from the ashes and is beginning to shine once again. The heroes of the Christian faith who have been sidelined are making their way back onto the “field.” Calvin, Luther, Edwards, Whitefield, Knox, and Spurgeon are returning to the collective consciousness of the church – especially in the younger generation. In my own Christian pilgrimage, I give most of the credit to R.C. Sproul for rattling the cage of my mind and shaping my hard heart in order to not only appreciate church history – but to actually love it! Another important contributor to this resurgence in the study of church history is Steven Lawson. In 2007, he introduced the series entitled, A Long Line of Godly Men. The first volume, The Expository Genius of John Calvin introduced readers to the Genevan theologian and sought to “raise the bar for a new generation of expositors.” Since that time, several new volumes have been released that survey the lives and ministries of Jonathan Edwards, Martin Luther, John Knox, C.H. Spurgeon, Isaac Watts, John Owen, and George Whitefield. The newest installment in the series, The Daring Mission of William Tyndale summarizes the life of brave Brit, credited with the first English translation of the Bible. Lawson presents the high points of Tyndale’s life and guides readers on a step-by-step tour which culminates in the martyrdom of a courageous and godly man. Lawson is quick to alert readers to the Calvinistic piety of Tyndale, a man who stood shoulder to shoulder with the other giants of the Christian faith. 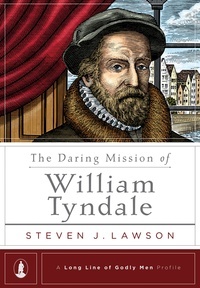 The Daring Mission of William Tyndale is yet another gift to the church from the pen of Steven Lawson. Young and old will be challenged, emboldened and encouraged as they read about a man who lived what he preached and died for a worthy cause.